A breba fig. It's the first crop of the year for a fig tree and is usually inedible. In the photo, it is green like the leaves. Image source. So, wtf is going on here?! Why does Jesus curse the fig tree? Was it because he was hangry and had an irrational emotional outburst? 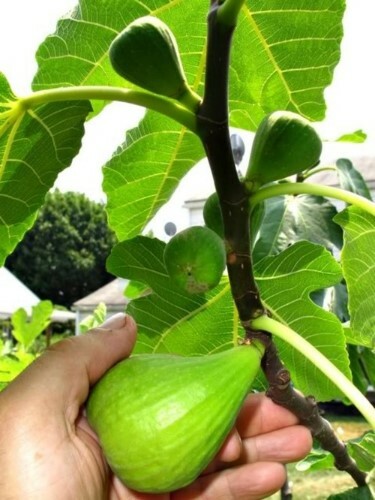 Fig trees produce two crops every year, but only one of them may be edible. The first crop, called the breba crop, occurs relatively early in the year on the previous year's growth. These fruits are frequently small, acidic and inferior in texture, but may be useful for preservation. The second crop occurs later in the year on the current year's growth and these figs should be edible. So, even though it wasn't the season for figs (as Mark's account tells us), the fig tree should have still had breba figs. But Jesus found only leaves, which means it wasn't a healthy tree that was going to produce figs in fig season either. The idea is, even though the tree appeared good, it really wasn't, and when Jesus cursed it and caused it to wither, he was exposing its true nature. He wasn't letting it get away with looking like a good tree when it actually wasn't. So maybe it's a lesson about hypocrisy and how "there is nothing concealed that will not be disclosed." Recently in the news we've found out about sexual assault and harassment committed by famous and powerful people, victims have shared their stories with #metoo hashtag, and people have also talked about sexual abuse in the church with the #churchtoo hashtag. A lot of this has been covered up for a long time, and it's good that people are finding out about it. Just as Jesus cursed the fig tree, let's curse the corrupt systems that cover up abuse- let them wither so everyone can see how evil and rotten they are. If the fig tree was already unable to bear fruit and Jesus was just exposing that fact, then why does he phrase his curse as "May you never bear fruit again"? It really makes it sound like the tree would have had fruit in the future, but Jesus decided not to let it, as a punishment for having only leaves right now. Seems like if this interpretation is true, Jesus should have said "you will never bear fruit again" or "you are a fruitless tree" or something. Is this a translation issue? Is the interpretation about exposing a fruitless tree wrong? Did Jesus phrase it in a weird way to make some kind of point? Was Jesus angry? Did Jesus do a bad thing here? Was he being unreasonable when he cursed the fig tree? Did Jesus ever do anything he later regretted? All right, it is super-not-okay what Jesus tells the disciples about "if you have faith and do not doubt" you can move mountains and "If you believe, you will receive whatever you ask for in prayer." This teaching leads Christians to believe that they have to manufacture certain emotions in order to make their prayers "work." Which is really bad for mental health (and I touched on this in my post Prayer Rates Don't Correlate With Actual Risk). It means you can't be honest about how you really feel, because if you allow yourself to be aware of your belief that something you prayed for isn't likely to happen, then it's YOUR FAULT when it doesn't happen. It's also worth noting that the fig tree is used in the Old Testament as a symbol of the nation of Israel. This passage could be interpreted as a judgment on Israel for their hypocrisy and lack of "fruit." The account of the fig tree is a fun one for apologetics because Matthew says the fig tree withered "immediately," while Mark has it withering by the next morning when they walked past it again. Here's an apologetics site that explains "Actually, if we want to be particular, that's not what Mark says. Mark says nothing about when the tree withered; he says that the next day Peter in particular noticed the withered tree." To which I say, ah yes, and Obi-Wan didn't "remember ever owning a droid" even though we saw him with R2-D2 all the time in the prequels because Jedi don't technically own property as individuals. Right. Yeah, that's why. Sure. This post is part of a series on the gospel of Matthew.